K2 and Spitzer images of W0607+24. The position of W0607+24 is marked by a red circle. SDSS J060738.06+242939.5, marked by an orange circle, is the brightest star in the K2 image. The three faint (r = 18.3 − 19.6) stars marked by cyan circles, contribute significant flux to the K2 measurement but are negligible at Spitzer’s longer wavelength and higher resolution. Other stars with r < 20 in SDSS are marked with blue circles. Credit: Gizis et al., 2016. (Phys.org)—Located some 23 light years away, the brown dwarf designated WISEP J060738.65+242953.4 or W0607+24 for short, turns out to be a source of radio emission. 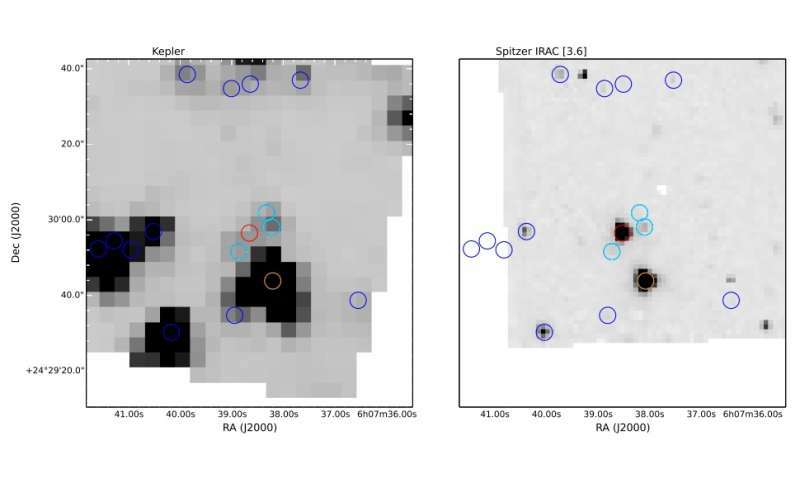 According to a research paper published July 4, this substellar object showcases quiescent radio emission, making it one of the most radio-faint, ultra-cool dwarfs yet detected. Brown dwarfs like W0607+24 are objects that are too large to be called planets and too small to be stars. With a mass below that necessary to maintain hydrogen-burning nuclear fusion reactions, they are much cooler and dimmer than main sequence stars. These objects could be also sources of radio emission, but the cause of this process is still not completely understood. Due to its proximity, W0607+24 is an excellent target for studying the nature of brown dwarfs. It is the nearest known late-L dwarf in the northern hemisphere, and the third-nearest in the whole sky, allowing researchers to study phenomena occurring in brown dwarfs. That's why a team of astronomers, led by John Gizis of the University of Delaware, Newark, carried out a series of mid-infrared, radio, and optical observations of W0607+24 to study any activity in this curious substellar object. Motivated by the results from NASA's prolonged Kepler mission, named K2, which obtained long time-series photometry of W0607+24, they observed this object simultaneously with the Karl G. Jansky Very Large Array (VLA) in New Mexico and NASA's Spitzer Space Telescope. The most important results were provided by VLA, as the team found that W0607+24 is a source of quiescent, non-bursting, radio emission. The scientists noted that the discovery of this process in this nearby object could be crucial for our understanding of this process in ultracool dwarfs in general. "W0607+24 is a valuable test case for understanding the mechanisms of radio emission in ultracool dwarfs. Some of the radio-detected objects emit rapid, intense bursts with high circular polarization, often found to occur periodically and attributed to coherent emission due to the electron cyclotron maser instability," the paper reads. The astronomers also suggested that the relative radio faintness of W0607+24 may be due to its orientation if the emission is concentrated at the poles. However, follow-up observations are needed to better characterize the detected radio emission and to eliminate all the uncertainties. The team also hopes for more significant findings when studying this nearby substellar object in the future. "As the nearest known northern hemisphere late-L dwarf, this offers many possibilities for future studies. For example, it could serve as an useful standard for line-broadening and polarization studies. If there is a planetary system aligned with the primary's rotation axis, then we would expect very little radial velocity signal but a strong astrometric signal," the researchers concluded. Moreover, the team plans to monitor additional late-M and L dwarfs in other K2 campaigns, expecting even more promising results. They are more distant than W0607+24, but because they are warmer, some are brighter and higher signal-to-noise than that described in this paper. In addition to detecting the radio emission, the scientists also estimated the age, mass and radius of W0607+24. According to the study, the object is less than two billion years old, has a maximum mass of about 0.055 solar masses and a radius approximately of 0.1 solar radii. We present a simultaneous, multi-wavelength campaign targeting the nearby (7.2 pc) L8/L9 (optical/near-infrared) dwarf WISEP J060738.65+242953.4 in the mid-infrared, radio, and optical. Spitzer Space Telescope observations show no variability at the 0.2% level over 10 hours each in the 3.6 and 4.5 micron bands. Kepler K2 monitoring over 36 days in Campaign 0 rules out stable periodic signals in the optical with amplitudes great than 1.5% and periods between 1.5 hours and 2 days. Non-simultaneous Gemini optical spectroscopy detects lithium, constraining this L dwarf to be less than ~2 Gyr old, but no Balmer emission is observed. The low measured projected rotation velocity (v sin i < 6 km/s) and lack of variability are very unusual compared to other brown dwarfs, and we argue that this substellar object is likely viewed pole-on. We detect quiescent (non-bursting) radio emission with the VLA. Amongst radio detected L and T dwarfs, it has the lowest observed L_nu and the lowest v sin i. We discuss the implications of a pole-on detection for various proposed radio emission scenarios.